Chai is a warm, sensual tea blend dating back thousands of years in Eastern culture. While regional varieties exist, most chai recipes call for a blend of healthy ingredients like black tea, black pepper, cardamom, ginger, fennel, and clove. Together, these vitamin, mineral, and antioxidant-rich herbs and spices do everything from boost your immune system to aid your digestion to fight inflammation. We’ll cheers to that! The Ultimate Beet & Berry Smoothie- A Hard-Hitting Blend of Nutrients and Flavor! There’s no quicker way to create a superfood masterpiece than pulling out the blender and making a morning smoothie! While “superfood” is not an official food label, the idea that certain ingredients are nutritionally more sound than others is completely legit. When you combine superfoods together, you get a quick blast of vitamins, minerals, antioxidants and other nutrients. Brr…it’s not only cold out there, it is quick becoming cold and flu season. As winter shivers bear down upon you, it’s a good time to learn how to pepper superfoods into your meals. “Superfood” is an unscientific general term that is used to describe foods that are incredibly nutrient-dense and have purported, but not necessarily scientifically proven, medical benefits. 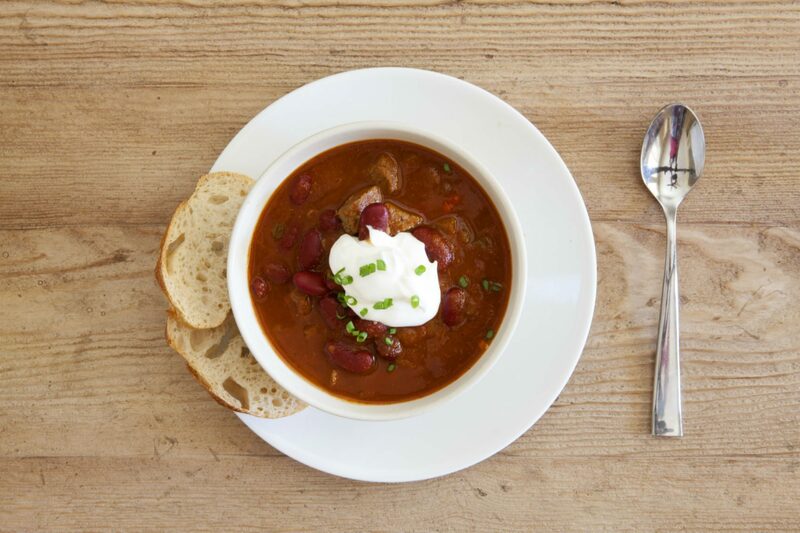 If you had to name a cozier feeling on a cold day than cuddling up with a bowl of homemade chili next to the fire (or in front of the TV watching football), we’re guessing you’d have a pretty hard time doing it. But if you’re like some people who seem intimidated by making chili, take a chili-pill and relax: It’s way easier than you think! It’s Time To Start Eating Fat Again! How many diet crazes can you name? A few come to mind for me: the cabbage soup diet, the Atkins diet and the Paleo diet. While I don’t disagree with all aspects of these diet crazes—and I even follow a few of their principles—one diet craze that I’m happy has ended is the low-fat diet. We are truly starting to realize that it’s time to eat fat; that eating fat will not make us fat; and that certain low-fat foods are far worse for us than we first thought! One of the biggest reasons behind weight gain is our tendency to reach for instantly gratifying foods when we’re hungry. It’s difficult to find the patience for cooking a meal when hunger strikes; most of us would rather reach for whatever is available. Do you want to dramatically reduce your risk of a stroke? Would you like to increase your chances of never getting cancer and heart disease? Is looking better because your skin isn’t aging as fast as it was appealing to you? I love chips! How about you? This is one snack food that I tend to eat far too much of and have trouble avoiding. So instead of ignoring my deep love for chips, I’ve tried to find the healthiest chips to satisfy my craving and keep guilt at bay (and my waistline from growing). There are two things that will always be around: eating and emotions. You have to eat in order to live, and as a human, you’re going to experience emotions. But when these two constants are paired together, it can become quite a challenging combination! It’s the truth: We all want to save money buying healthy food. When you’re buying healthy food, you often are going to spend more money because of the difference in quality. This is often the reason people choose less healthy options. But there are ways to save money when you want to eat right and take care of yourself. Save your bucks and feed your body the best!